Since their success at SpaceX’s Hyperloop competition this past January in California, the University of Maryland’s Hyperloop team, UMD Loop, has garnered local and university attention and recognition for their efforts. The team has received several invitations to local organizations to showcase their Hyperloop engineering project including Local Motors’ Technology Discussion and NASA Goddard Space Flight Center’s Engineering Colloquium. March 7, UMD Loop attended Local Motors’ Technology Discussion in Washington, D.C. with the Danish Minister for Business, Industry and Financial Affairs. The event focused on how co-creation and innovation, particularly by collaborating with universities like the University of Maryland, can boost entrepreneurship. Local Motors not only sponsors UMD Loop, but also had a hand in partially machining the pod at their facility. UMDLoop visits with Local Motors. Aerodynamics Lead, Paul Garvey, took the initiative to help establish the relationship with Local Motors in the months leading up to the competition in California. “Local Motors welcomed us with open arms, providing us not only with necessary resources needed to create our shell, but also an incredible learning environment and flexibility,” Garvey said. During the event, UMD Loop members John Linko, Vineet Padia, Paul Garvey, Team Captain, Kyle Kaplan and Project Lead Victor Meszaros gave a presentation on the team’s pod, Prometheus. “The opportunity to present at Local Motors was really exciting for our team, everyone there was incredibly interested in our work and very supportive of our endeavors,” Kaplan said. Garvey added that the team came back to campus feeling even more like pioneers, and proud to be part of a community that fosters such a high level of innovation. NASA Goddard featured UMD Loop in their Engineering Colloquium Series on March 7. Prior to the presentation, team members received a tour of the facilities, learned about NASA’s history and got to see the James Webb Space Telescope. Brent Warner, a Thermal Engineer at NASA Goddard, reached out to UMD Loop with the opportunity. “We’re always on the lookout for engineering topics that might interest our audience. UMD Loop was an obvious choice,” Warner said. “It concerns some exciting, flashy, new technology.” Warner explained that a local speaker was important as well because employees, many of whom are Maryland alums, would feel a stronger connection if the presenting institution was their alma mater. Sashank Sadula, a sophomore aerospace engineering major and the team’s assistant engineering lead, presented at the colloquium along with Kaplan, Neel Patel, project manager and Tom Fowler, engineering lead. “The Q&A we did after the presentation showed a wonderful engagement between us and the professionals. I’m grateful for Goddard and the NASA community as a whole in showing their continual support for students like us and the work that we do,” Sadula said. The team was recently recognized by the University Maryland and honored as an innovative student organization at Innovate Maryland, a university event that celebrates UMD inventors and entrepreneurs. 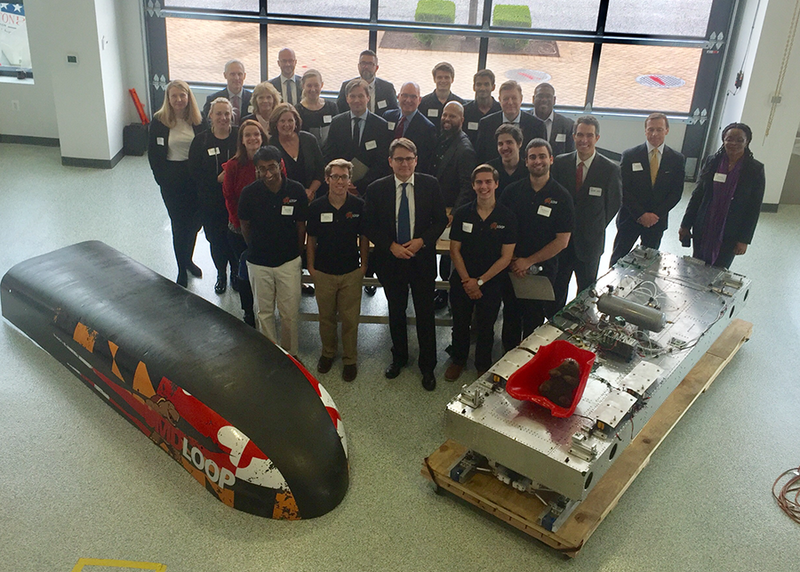 UMD Loop has valued the opportunity to share their accomplishments and innovations with organizations that share the same passion for engineering and innovation.